FiiO K1 review | What Hi-Fi? 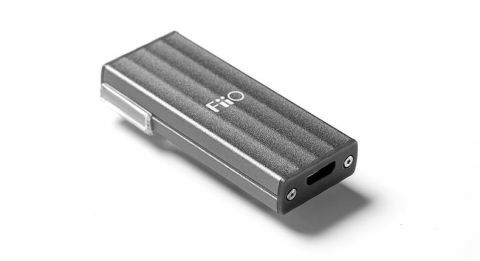 Billed as a portable headphone amplifier and DAC, the FiiO K1 is a tiny, plug-and-play device in the same vein as the excellent Audioquest DragonFly Black and Cyrus soundKey class leaders. We’ve heard some decent digital products from FiiO in recent years, especially at the affordable end of the market - and the K1’s price certainly piques our interest. However, the K1 doesn’t come close to making our music sound better. In fact, it makes it sound worse than the sound directly out of our Apple laptop. The K1 looks promising when we first unbox it. The USB DAC is even smaller and lighter than the Audioquest or Cyrus DACs. Despite weighing a feather-esque 11.3g and costing less than two tickets to an IMAX, the K1’s neat ‘titanium grey’ aluminium casing feels well made and not at all cheap. It’s as plug-and-play as the Cyrus soundKey, needing just a cable to connect it to your laptop – a micro-USB to USB-A cable is supplied with the K1. Once plugged into your laptop or computer, a blue LED next to the 3.5mm headphone jack lights up to indicate it’s working - and then you can start using the K1 DAC immediately. Our only quibble is the plastic clip attached to the DAC. You can’t remove it without breaking it, so unless you want to fasten it to your clothes like a pocket protector (we like DACs, but not that much) it feels a bit pointless. Like similar USB DACs, the K1 takes power from your laptop. File support is impressive for a budget DAC at this price - all popular formats and high-resolution files up to 24bit/96kHz (but not DSD) are on the table. That's the same upper limit as the DragonFly and soundKey. But all these great features count for nothing when you start using the K1. Plugged into an Apple MacBook Pro (we also use a MacBook Air) and paired with Sennheiser Momentum over-ears, the FiiO K1 certainly makes our laptop-stored music sound louder, punchier and more solid. The pounding drums in Marmozets’ Major System Error hit with a hefty thwack, while the crunchy, raucous guitars sound meaty. That added weight and boost in volume is appealing at first. But by adding the K1 DAC, you sacrifice openness, subtlety and dynamics. Timing goes out of the window. Plugging our headphones back into the laptop’s own 3.5mm port, we hear a more open, detailed sound. Guitars attack with greater precision and agility. The piercing vocals sound clearer, with genuine intent and layers of nuance coming through. Every song we play enjoys better timing without the FiiO DAC than with it. Played directly through the laptop’s headphone jack, the dynamic shifts in En Vogue’s soaring ballad Don’t Let Go swoop and soar with excitement. It’s more fun, and more expressive. The K1 saps away that fluid, rhythmic character. Its thicker sound masks finer detail, and you lose much of the song’s vitality. Switching to more capable (and pricier) DACs such as the Audioquest or Cyrus shows exactly what a USB DAC/headphone amp is meant to do - but it’s an unfair and pointless comparison at this point. When a DAC sounds worse than the source it’s meant to be improving, it has already failed at its job no matter how low the price. We simply can’t recommend a product that worsens the sound quality of your source. The FiiO K1 DAC may look enticing if you’re hunting for a bargain deal, but we’d stay well away.